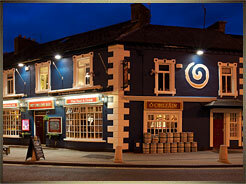 We offer an extensive bar menu with a wide range of Irish and international dishes for all appetities. Some of our daily specials include Traditional Irish Stew and Fresh Smoked Salmon. Our meals range from lunches to dinner with the option of finger food available for groups. All our produce is bought fresh from local markets. Ask a member of staff for the source of all our meats and vegetables. We are open from 10.30am till late serving food up to closing time. See our menu below for more details. All our meat is 100% Irish and supplied by Costelloe Butchers, Adare. Our ice cream is supplied by Adare Farm Foods.